Immigration reform: Republicans want to "separate the salt from the sugar." 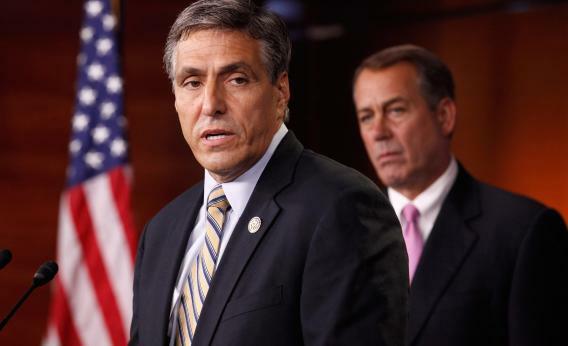 Pennsylvania Rep. Lou Barletta wants a sweeter deal for no-fault immigrants. I spent yesterday irritating House Republicans outside their major starting-the-conversation confab, a two-hour-plus series of questions and answers in a closed-off basement meeting room. The results? Some reporters are saying there was “no consensus,” but I was hearing more and more Republicans suggest that some version of the DREAM Act might be sellable, as a way to prove to swing voters that, hey, they weren’t heartless. Some number of immigrants could be legalized, and the rest would remain illegal. Even Lou Barletta, who became famous in the 2000s for passing illegal immigration attrition laws in his Pennsylvania town, was talking nice about it. Kate Nocera, who was also there, explains the line of thinking Republicans are using to explain why the Senate bill must die. Many of them pointed to the recent announcement that the administration would delay the health care law’s employer mandate as their prime example of how he would not enforce laws passed by Congress. Much of the immigration bill wouldn’t really go into place until after the Obama presidency, but you work with what you’ve got.